For those times when only the best will do! Some great information about Limo Bus Seattle! We founded Limo Bus Seattle because we felt that there just wasn't good enough party transportation in the area. There are certainly other companies in the area who do what we do, but we believe that we do it better. We've put so much time into furnishing our buses with the most luxurious features, from flat screen televisions to wraparound leather seating. We maintain each element of our buses in the most perfect condition possible. You will not find a smoother ride or a more entertaining experience on the road than Limo Bus Seattle. We hire only the best of the best chauffeurs, true professionally trained chauffeurs, not just drivers! This is one of those distinctions that really sets us apart from the rest. They have to pass our rigorous testing process including background checks and drug tests in order to become one of our chauffeurs. Beyond that, we keep all of our necessary permits up to date, and we are insured to the fullest extent allowed by the law. You're completely protected when you're on the road with us, and that means you're free to party to your heart's content. Proud to serve greater Seattle! The events that we're most often hired for are bachelorette parties, bachelor parties, sporting events, high school proms, weddings, birthdays, and even family reunions. 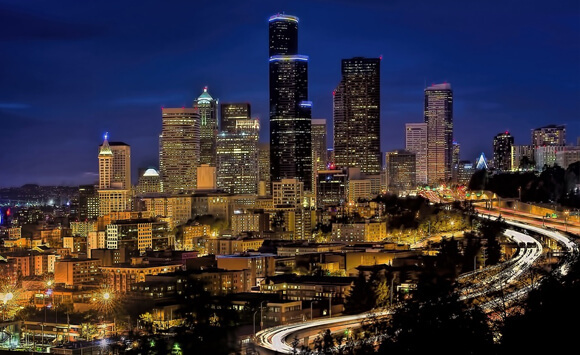 We also do a lot of sightseeing trips, taking groups of people to see all the famous landmarks in Seattle and visiting many of the wonderful museums and galleries in the area. Corporate events are also a good reason to hire us for our services. The booking process is incredibly simple. Just give us a call or shoot us an email (our contact information is right here). Include information about the type of event you'll be having, your general budget, the desired dates and times of service, the destinations you plan to visit, and the number of people who will be in your party. You can pay with Visa, MasterCard, American Express, and Discover Card, and all you've got to do is make a deposit to secure your desired date. As you may have guessed, we are entirely a customer first organization! In this industry, there's no sense in cutting corner at our customer's expense. It's not every day that folks rent a limo bus or limousine for whatever reasons they might have, and we take it upon ourselves to give you the royal Limo Bus Seattle treatment that you both expect and deserve! Looking for a limo bus in other cities? You owe it to yourself to check out these great companies! For west Michigan try Kalamazoo Party Bus. For Colorado go to Denver Party Bus.